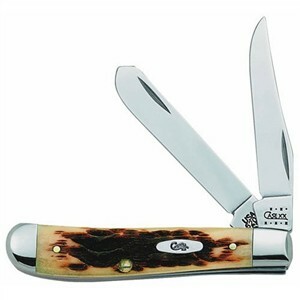 The Case Mini-Trapper isn't new to me -- it's one of the knives I already know and like. In just 3-1/2 inches of closed length, the Mini-Trapper provides two strong blades with common-sense designs and useful strength, plus a handle big enough to grip and shaped to stay in the hand. There's no pocket clip to wear a hole in your palm if you use it frequently. It's a perfect size for the pocket with no need for a clip. The clip point and spey blades are good for slicing and careful piercing, even without the lockback most new pocket folders include. Hook the slip joint blade's notch with your thumbnail and swing it open -- the slip joint pressure bar holds the blade in position, but all it takes is a push to close. You don't get one-handed opening with this old design, but it's easy to close with only one. Buying a new pocket knife is something I still do from time to time, usually because I lost the old one, but sometimes just because I'm curious. With so many choices of new knife designs, it can be hard to shop for a pocket knife today -- but if you choose the Case Mini-Trapper, you won't be wrong. For this classic knife with more size and a couple of modern improvements, see the Case Stag Trapperlock.